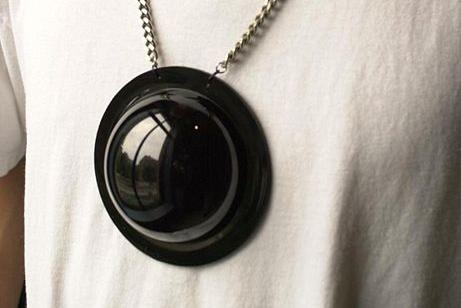 "Sousveillance" camera from G20 riots in Toronto allows wearer to film everything occurring from under rather than over. This picture, from Wikipedia, of a necklace webcam, was taken in a stairwell in a building on St. George Street in Toronto. The sousveillance dome is a kind of Situationist critique of surveillance, in the manner of an inverse surveillance. By re-situating the everyday familiar objects of ubiquitous surveillance ("eye in the sky") down at human level, we reverse the Sur (French for "above") to Sous (French for "below"). The Stanley cup riots are safely in the past. We have inquiries, recriminations, and requests for forgiveness. While the fingers are pointed, and authorities wonder how to prevent it in the future, it would be wise for all of us to reflect on the core lesson: civilization is a precious and fragile thing. By civilization, I mean that large set of values, behaviours, biases and social pressures that allow us to live peacefully, cheek by jowl, in an increasingly frenetic world. Civilization is what allows me to bike calmly down the shoulder of a busy road, while hundreds of fellow citizen drivers could easily kill me through a moment of malice or inattention. Civilization is not taking the express line at the grocery store when you have twenty five items. It is also remaining calm when the person in front of you violates this rule. Civilization allows people to congregate in large crowds without fear of being crushed. Civilization is the good side of political correctness – politely editing one’s own speech to avoid unnecessary offence. Some people think civilization comes only from law, from effective explicit rules and consequences. Certainly, rules are part of it. In societies without the rule of law, we find a lot of behaviour we might deem uncivilized. Still, most of what passes for civilization goes beyond the fear of prosecution. People don’t wave someone through an intersection because of a law. Nor do they line up in more or less orderly fashion for fear state sanction. They do it because it is expected by the culture, and their natural empathy guides them. To be civilized is to makes small personal sacrifices, to resist impulses, to give up personal advantage in the implicit knowledge that if most of us behave that way, we will all be better off. In a sense, to participate in civilization is to partake in a grand non-zero sum game. Through co-operation and deferred gratification, we make “the pie” bigger for all. But, the Stanley Cup riot reminds us that civilization is fragile, collectively and individually. Perhaps that initial official story was correct, and the riot was sparked by “agitators” who came to town with intent. And, as Evan Hu pointed out in his column, "The stupidity of young men", the majority of the bad behaviour was perpetrated by young men. Still, young men don't always behave this way. A lot of the images show what seems to me to be run of the mill hockey fans. In normal circumstances, a lot of these guys would be kind, polite, and civilized. They may be the proverbial guy next door – “he seemed so nice”. When circumstances change though, behaviour can change. There has been an undertone of smugness in a lot of the post-riot commentary. Listening to call in radio shows, the sense is that the rioters were the other. It was all about the age, gender, altered chemical state, and upbringing of the rioters. I chuckled to hear someone suggest this could never have happened years ago when children were “raised right”. Perhaps they had never heard of the Rocket Richard riots of 1955. The truth is that many of us will change our behaviour when circumstances change. Civilization is a form of social contract. And, in some situations, human nature deems the contract void. Large crowds are one such situation. The theory is that individual sense of accountability dissolves in a crowd. Without accountability (legal or moral), impulse control melts away. It will be interesting to see if this will change with the advent of pervasive “sousveillance” – everyone has a camera. The eruption of public shaming sites after the riot may be a game changer. Other situations occur when an individual or group becomes excluded from the circle of empathy – excluded from the civilization and therefore not deserving of protection. One could look at any racial ethnic conflict for an example. Closer to home, one might consider police abuse of power during the G20 protests in Toronto in 2010. The common thread is that, depending on circumstance, otherwise good people may do bad things. And this is the lesson to be learned from the Vancouver riots. We should not be smug. We are fortunate to live in a peaceful and civilized society. Each of us contributes to that civilization every day through our actions (and inactions). We should not take our good fortune for granted. The potential to behave badly is innate in all of us. Our institutions need to be encouraged to learn from their mistakes in allowing the riots to happen. Individually, we should all guard against the impulse to cheat a little. Do let that driver in when they wave. Wave back when someone lets you in. Recycle. Give up your seat on the bus. And, the next time you have twenty five items and intend to pay with loose change, please, for the love of civilization, stay out of the express line. 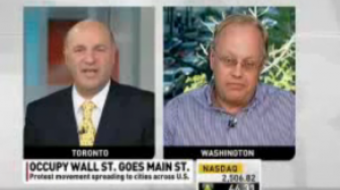 Occupy protests in Canada and the birth of the "nothing burger"
Kevin O’Leary thinks the Occupy movement has nothing much to say. Mark Carney differs. How might idealism be turned to action to fix capitalism? Can the workers’ party be environmentalist? Leading up to the Ontario Provincial Election, Environmentalist are abandoning the NDP. Is this a blip or a trend with national implications? No one likes taxes, but when did they become anathema to discuss in a democracy?